Mumbai Magic: Dastangoi in Mumbai - wow! 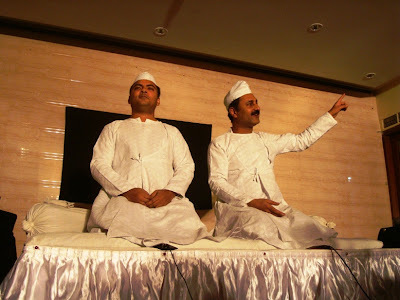 Dastangoi in Mumbai - wow! Wow. It's not often you get to see a live performance that is this fantastic. To think I almost didn't go! This is Dastangoi, the art of story-telling, that used to be popular among the Mughals. 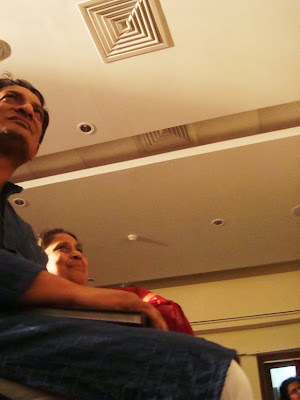 I went for a show a couple of weeks ago, at M C Ghia Hall in Kala Ghoda. The Mughal Emperor Akbar loved Dastangoi performances, and encouraged them in his court. The art died later; so this is a revival of a lost form. But the show that I saw was different in some aspects. For one thing, the original Dastans (tales) were usually told by a single guy. The Dastan I heard had two narrators; Danish and Mahmood. They took turns to tell the story to the audience; skillfully passing the baton back and forth. They also conversed with each other as part of the story, often enacting conversations between two different characters. Their timing was perfect. They were witty and the script was incredibly funny, so all through the performance, we were rolling with laughter. If you ask me, it was much better than having a single narrator. Here's a photo of Danish and Mahmood with mock-serious faces, saying the most satirical things. The audience was literally in splits. We were forbidden by the duo from clapping in appreciation, so all we could do was say wah-wah, wah-wah in traditional style, and collapse laughing. The original Dastans were about djinns and magic and adventure and what not. Here's a scene from the most popular Dastan, the Epic of Amir Hamza. Amir Hamza is a larger-than-life hero who travels to strange places, fights demons, trades witty remarks and generally saves the day. No wonder Akbar loved him! I can imagine the entire Mughal court going ha-ha-ha, wah-wah, wah-wah, just as we did! 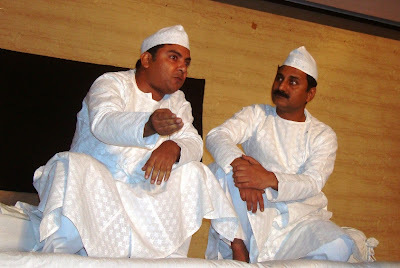 Under Akbar's patronage, Dastangoi evolved into a popular form. 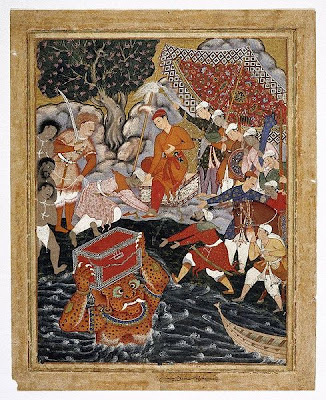 This illustration was commissioned by Akbar, as part of the Hamzanama, a huge series of 1400 such drawings, illustrating all the adventures of Hamza. Look carefully and you will see a giant called Arghan Deo rising from the water bearing a gift for Hamza. I wonder what this particular fairytale was! Because the Dastangoi format requires a magical setting in a strange land, Danish and Mahmood invented a strange country, peopled by strange characters. But it was easy to recognize comparisons - there were the poor landless, there was an oppressive state and police, and a shoddy legal system. The story was told in satire form; the humour saved it from being a one hour moral sermon. It was powerful and appealing, and the audience responded with many wah-wahs both for the content as well as the presentation! 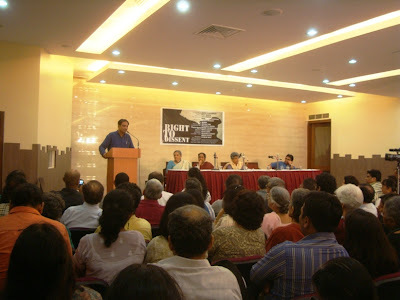 Earlier in the evening, both Dr. Sen and Illina addressed the audience on the issue of sedition laws and how they can be misused by the state. Dr. Sen is Vice President of PUCL (The Peoples Union for Civil Liberties), a 25-year old organisation formed primarily as a platform for the protection of civil liberties and human rights. 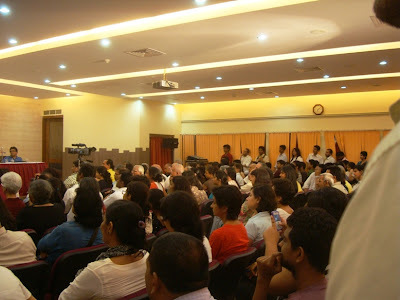 The audience for the speech represented Mumbai's educated elite (no surprises there) - social workers, writers, activists, lawyers, film makers and college students. People listened carefully when the Sens spoke, and clearly there was a sense of real concern among the audience about the issues that were discussed. I went with my friend Pooja. Before the speeches, we made a little foray into Jehangir Art Gallery, where I bought a couple of paintings. 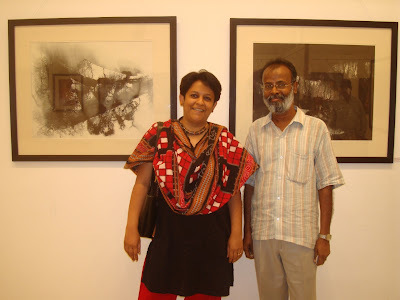 This is me with the artist, Somnath Roy, who teaches at the Government College of Art and Craft, Calcutta. The paintings are now hanging on my wall at home. Later that night, Pooja and I went to dinner at Chetana, where we had a Rajasthani and Gujarati thali and discussed the performance (we both loved it). I dropped her at Churchgate Station for her train, and returned home happy. All in all, a good evening, even if I did return significantly lighter in the pocket! These guys must be really skilled to keep the audience captivated for a long time. I had attended one long back way back in Kerala which is known as "Kathaprasangam". Shez, see the Dastangoi link which is there in the article, in the second paragraph. Must have been a really unique experience considering story telling is always confined to books and the TV once you grow up. Will keep an eye out for the next performance. Of beads and happiness !